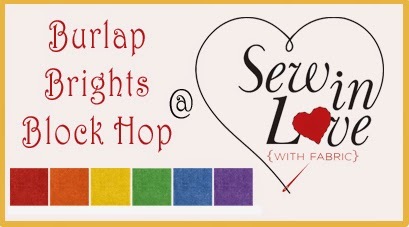 Welcome to the tenth day of our Burlap Brights Block Hop! We hope you've been enjoying the eleven block tutorials our designing friends have been sharing here this week and last week. Be sure to stop by each day to see a new block and have a chance to win some Burlap Brights for yourself! 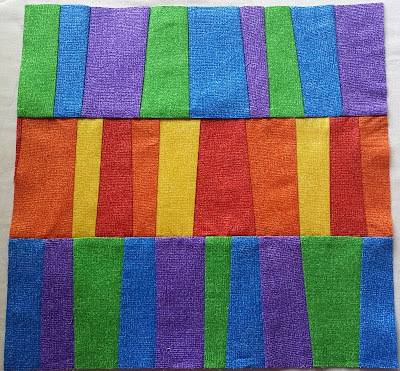 Today, Jessica from Quilty Habit is sharing a wonky improv block using all six of the rainbow colors. 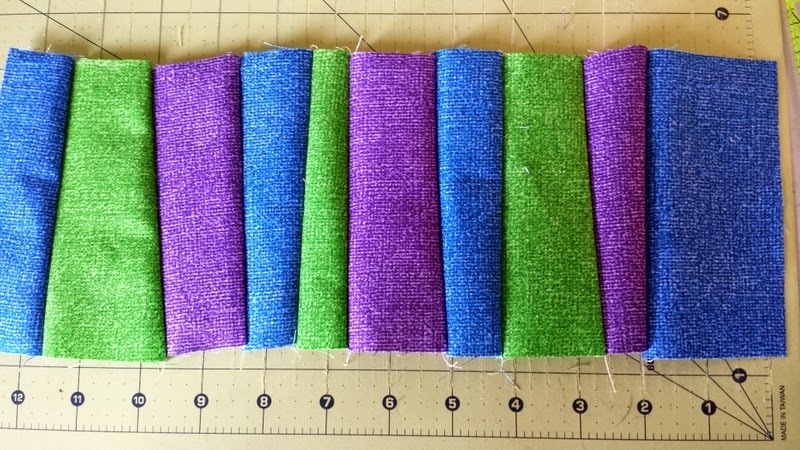 Check out her tutorial and then head over to her blog to enter for a chance to win a fat quarter bundle of the six Burlap Brights prints featured in our hop. Hi, I'm Jessica Skultety of Quilty Habit, and I'm excited to be a part of the Burlap Brights Blog Hop! I'm a teacher and lecturer of modern and modern traditional quilting, long-term blogger, writer, commission sewist, and home machine quilter. 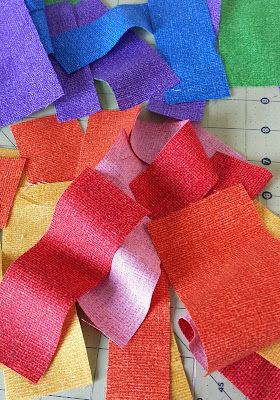 I blog several times a week and you can also check up on me on Instagram daily - @quiltyhabit. 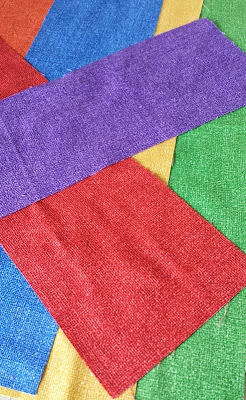 These Burlap Brights textured solids add a bit of "oomph" to what could just be a solid (I love solids, too, but that's beside the point). I can't wait to add these to my fabric stash, which is sorted by rainbow color. 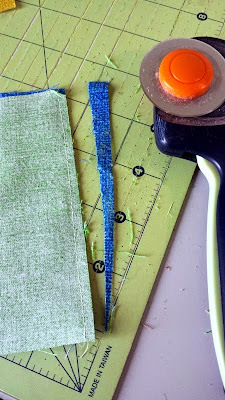 I use bright colors the most in my sewing, and I also love improvisation. Put both together and you have magic! That's why I decided to write a tutorial for an improvisational block, which I'm calling Wonky Piano Keys. 1. Cut a strip 5" wide x 18" from each of your rainbow fat quarters. 2. 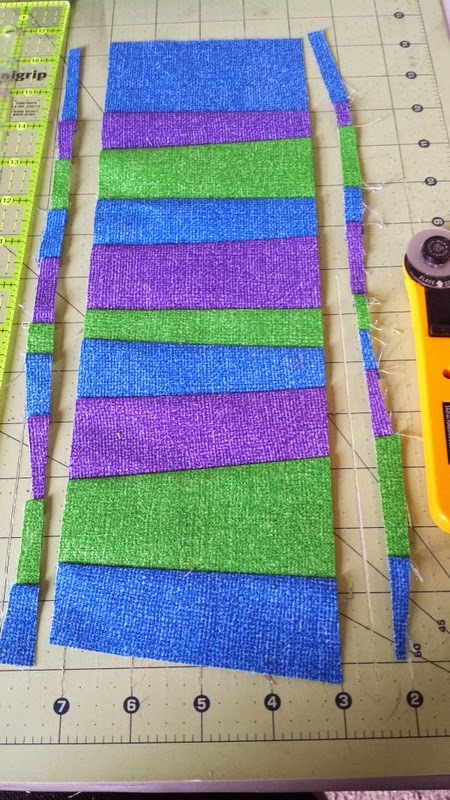 Cut 6 strips from each color between 2.5 inches and 1.25 inch wide. on top of each other but I have both showing here, so you can see). and one middle panel of warm colors. 4. Sew strips together at a slight angles, with a quarter inch seam allowance. less than 4.5 inches. I decided to alternate the colors and the sizes. 5. Trim after sewing each strip. 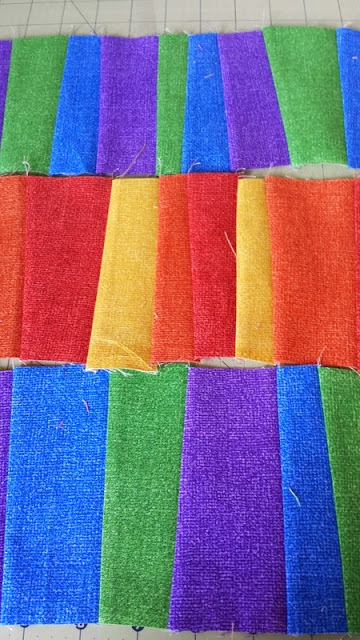 strips in the same direction. based on the size of your angles. 7. Repeat steps 4-6 for two more panels. 8. 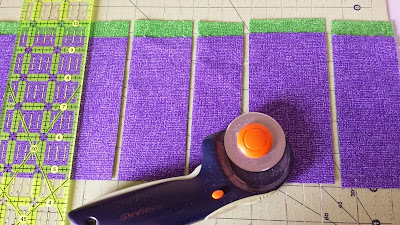 Trim all strips down to 4.5". 9. Sew together using a quarter inch seam. 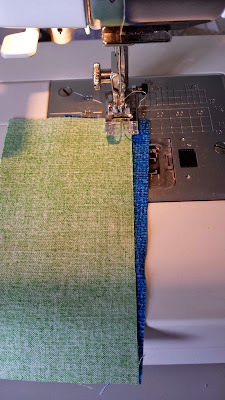 Press both long seams. 10. Trim block down to 12". Enjoy your new block! A whole quilt of these would be fabulous. inspired to experiment with improvisation! 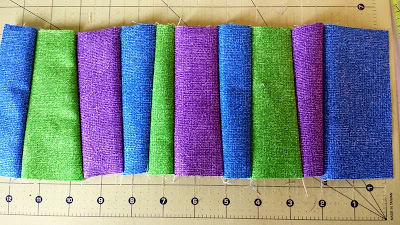 bundle of the six Burlap Brights she used to make her block. Make sure you check out each day's tutorial! Beautiful fabrics and block.Thanks for the tips! I like this block. Thank you for the tutorial. Thank you fou the tutorial . These colors would be nice in a log cabin block too. How fun! Great tutorial, Thank you! I follow you on bloglovin'. A rainbow quilt of some sort is on my list. I've seen so many beautiful options.